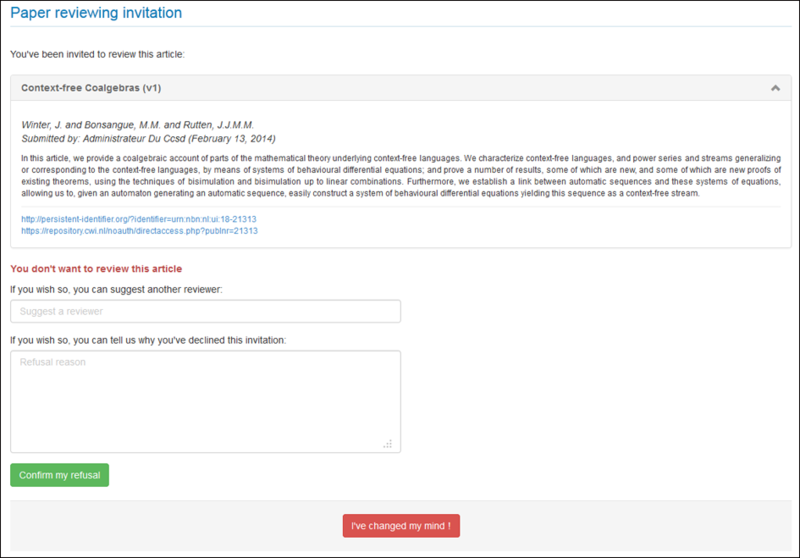 The reviewer is invited by email to review a submission, which includes the manuscript title and the link to the online answer form. In the e-mail the reviewer can see some brief information about the submission. To decline the review, click the “I don’t want to review this article” button. At this stage, it is possible to suggest another reviewer in the dedicated text box and to give a reason for the refusal. Both fields are optional. In some cases, the journal may require you to declare whether or not you have competing interests with the article being reviewed. If this is the case, this can be given as a motive for refusal. Please note that, whether the reviewer has accepted or refused the review, he can change his mind by clicking on “I’ve changed my mind!” button. This will take them one step back. 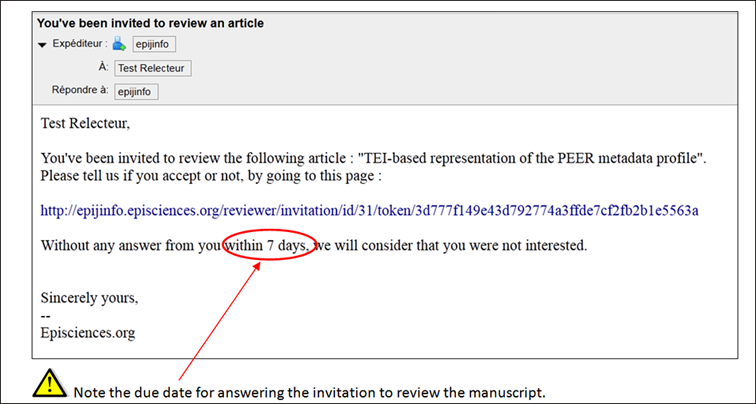 If the review is accepted, the reviewer must then go to the journal website, where the review process can begin. An account is required and the reviewer will need to be logged in. To accept the review, click the “I agree to review this article” button. 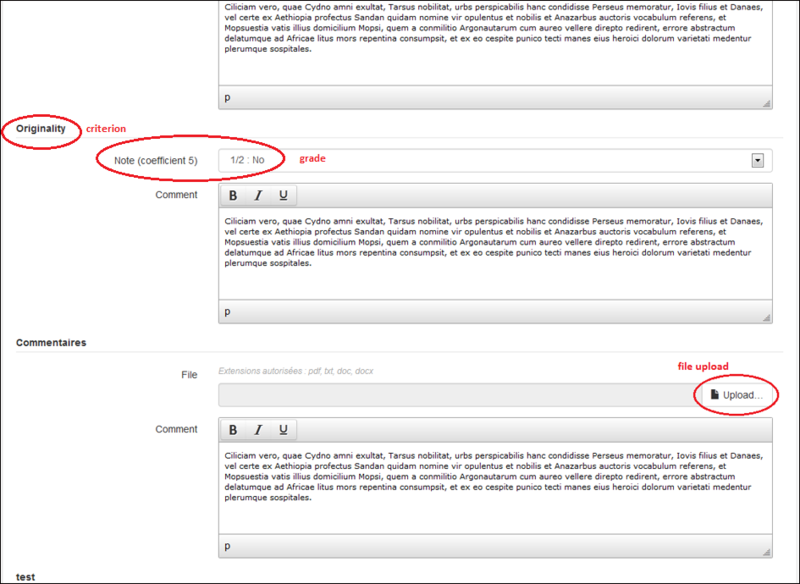 The reviewer must check the box and select all required fields. Please note that, whether the reviewer has accepted or refused the review, he can change his mind by clicking on “I’ve changed my mind!” button. This will take them one step back. To accept the request, click the “submit” button. A confirmation that the review has been accepted appears on the screen. 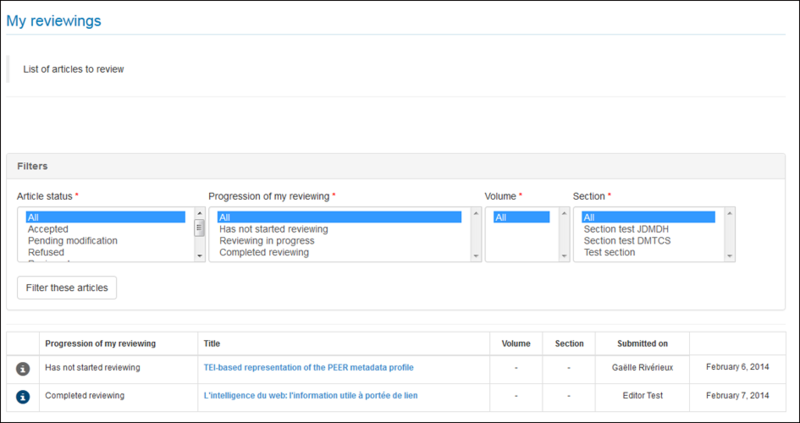 The reviewer must then go to the journal website, where the review process can begin. An account is required and the reviewer will need to be logged in. Reviewers who don’t have an account will need to create one. A valid email address, a username and password are required. If you already have an account, log in using your account details. If the reviewer is reviewing for several journals hosted by Episciences.org, a single account is needed. To see the submissions you need to review, click the “x reviewings” link. It will take you to your active reviewing page. This page lists the submissions, which you have been invited to review or are currently in the process of reviewing. The articles listed are organised by status. The ones awaiting review will appear first. 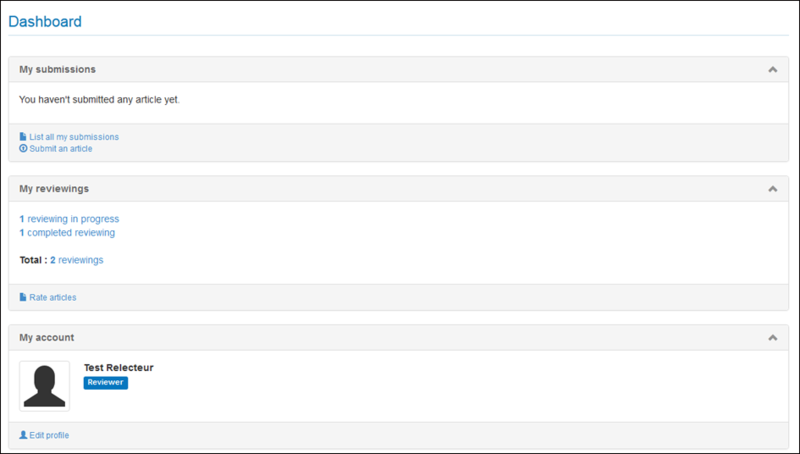 They can be filtered by status, reviewing state, volume and/or section. Clicking on the linked title will take you to the review process. Once on the article’s page, its abstract, a link to the open repository where it has been deposited, a direct link to the pdf and a rating grid will appear. The submission can be downloaded as a file to your computer by clicking on “Download this file”. You can also visit the webpage of the article through the open archive; to do so, click on “Consult the article webpage”. There you will find the original submission with the abstract, keywords, the successive versions (if they exist) and possibly materials the author may have uploaded in addition to the submission, such as data sets, research instruments, or source texts. The rating section gathers text-boxes corresponding to criteria defined by the editorial board, where the review can be either entered by hand or pasted. Each criterion must be evaluated either with a grade and/or a comment. 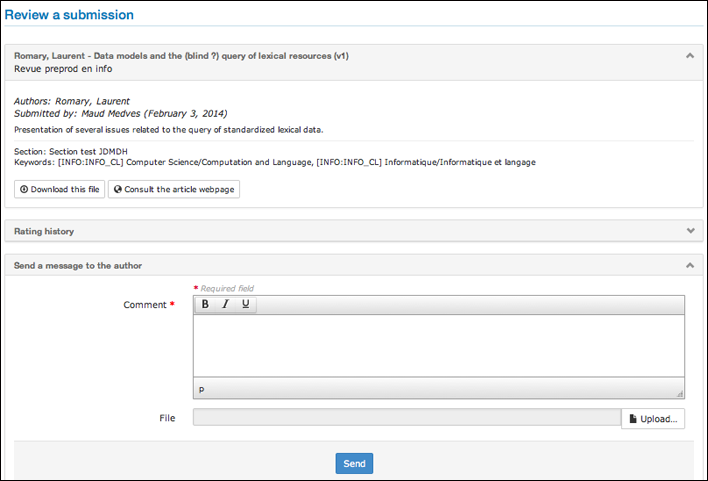 The reviewer also has the option, in addition to entering a review, of uploading files for the editor and/or the author to see. These files may be an annotated version of the submission or some relevant data or other materials that will assist editor and/or author. The correspondence between the reviewer and the author is saved in the system and accessible at any time.